This entry was posted on March 27, 2013 by Paul. Here’s an opportunity for you to get your hands on the product that proved such a sensation at our recent London Roadshow – the Celluon Magic Cube. We've got three of these brilliant little devices, each worth £145 (ex-VAT), to give away in a simple-to-enter competition. All you have to do is follow the link to go to our website and fill in your details. The names of three lucky winners will then be drawn at random after the closing date of Friday 5th April. For those of you not lucky enough to win one of the cubes in the draw, you can purchase a Magic Cube at 12.5% off our normal retail price between now and the end of April! This reduces the Magic Cube from the normal price of £145 (ex VAT) to £126.88 (ex VAT). The Celluon Magic Cube looks and feels like science fiction, but is anything but. It’s a fully-functional, full-sized computer keyboard...yet it doesn’t really exist! 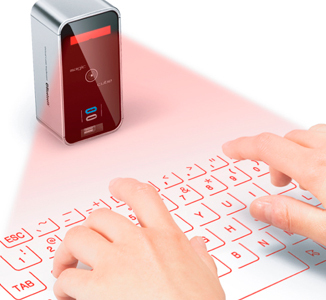 The Magic Cube uses laser technology to project a ‘virtual’ keyboard onto any flat surface, allowing you to type by touching your fingers on the desk or table top. For users of iPhones, iPads and Android devices, it provides a comfortable, near fatigue-less way of entering data. The large keys and familiar layout of the projection keyboard allows for faster and more accurate inputting than can be achieved on the device’s integral keyboards. It’s one of a number of Bluetooth-enabled devices we now have available to support the fast-growing number of mobile workers and those who simply own a tablet or mobile for fun. These include the Freedom Pro Universal Bluetooth Keyboard, the Microsoft Bluetooth Mobile Keyboard 5000, the Voyager Legend Bluetooth Headset, and the Logitech Ultrathin Keyboard Cover for iPad. Good luck in the draw to win the Magic Cube!